THIS IS A VERY SPECIAL POST! Make sure you read the whole thing and scroll down for pics. 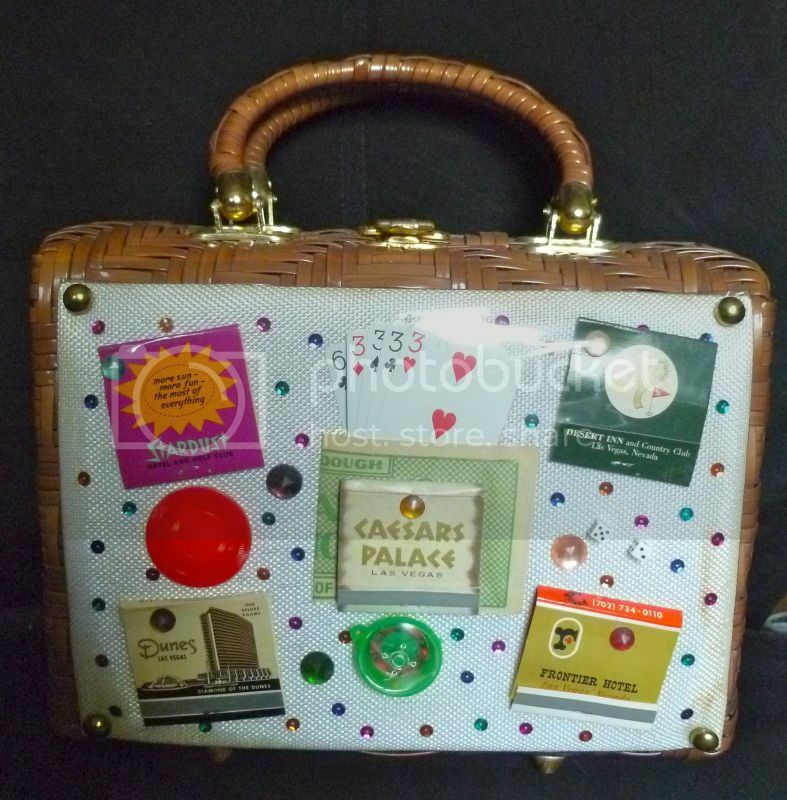 Wicker Las Vegas Casino-Motif Purse. 1960s. Maker: Faye Mell. Natural wicker purse with cloth front encased in plastic. Behind the plastic are matchbooks from old Las Vegas casinos. It also has miniature playing cards, a fake ten-dollar bill and a tiny roulette wheel. Rhinestones, sequins and brass hardware complete the look. Tag says "Handmade Exclusive Faye Mell Design Fleurette, Inc. Miami, FLA."
Faye Mell Designs by Fleurette of Miami is one of my very favorite designers of the mid-century. I was surprised to learn, via the website Findagrave.com, that Faye Mell moved from Florida to Los Angeles, very near me, in her later years. I'm disappointed that I was never able to interview this talented lady, who passed away in 2010, but glad to know that she received a nice tribute on this page. 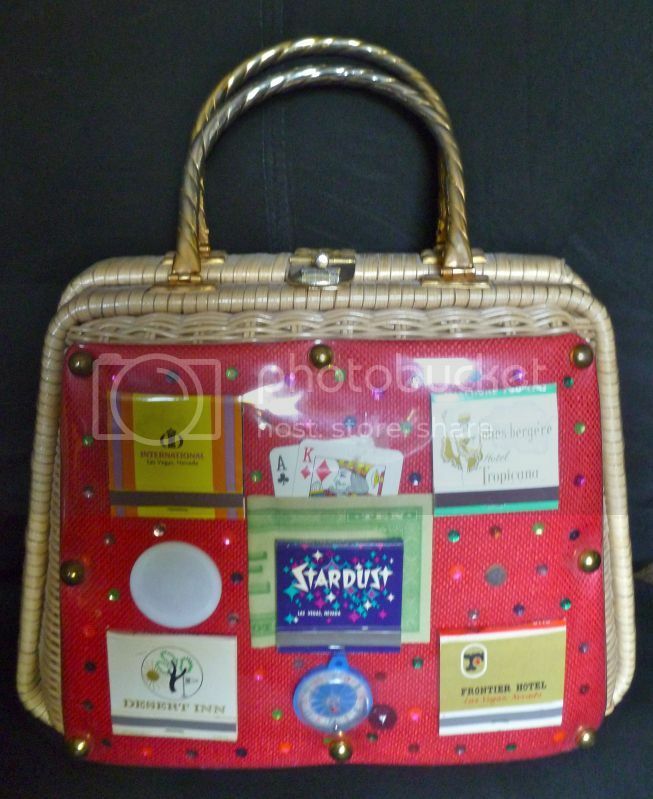 Here’s my purse in natural wicker. I also have a variation of it in brown wicker. Let’s not forget the gold lamè. Did I mention I have TWO in gold lamè? Don’t hate. It’s not nice. We went to Vegas two years ago and visited the pawn shop that's on the TV show Pawn Stars. 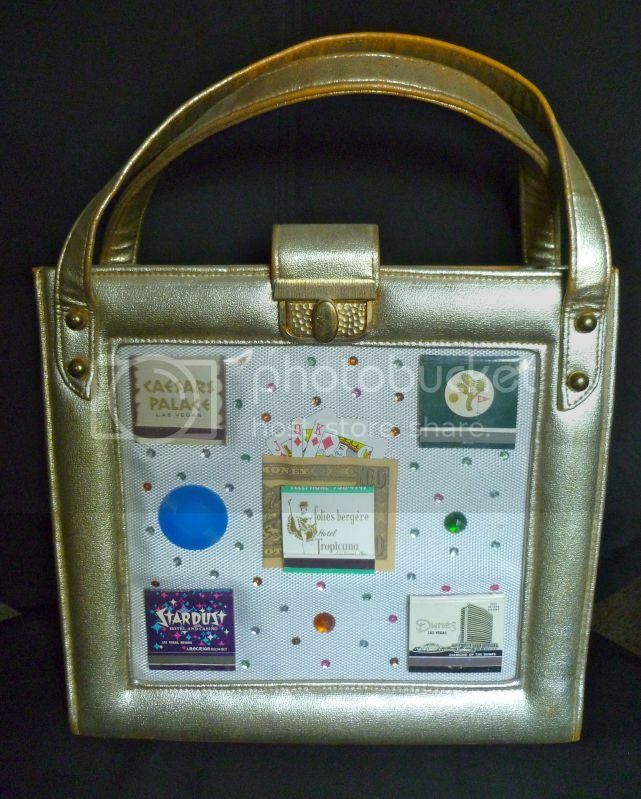 I had one of my gold Faye Mell purses with me and my husband told me I should see how much they'd offer me for it. I told him NO WAY! ...of course, he thinks I'm nuts, since I have two. But there's no way he's ever going to understand. P.S. 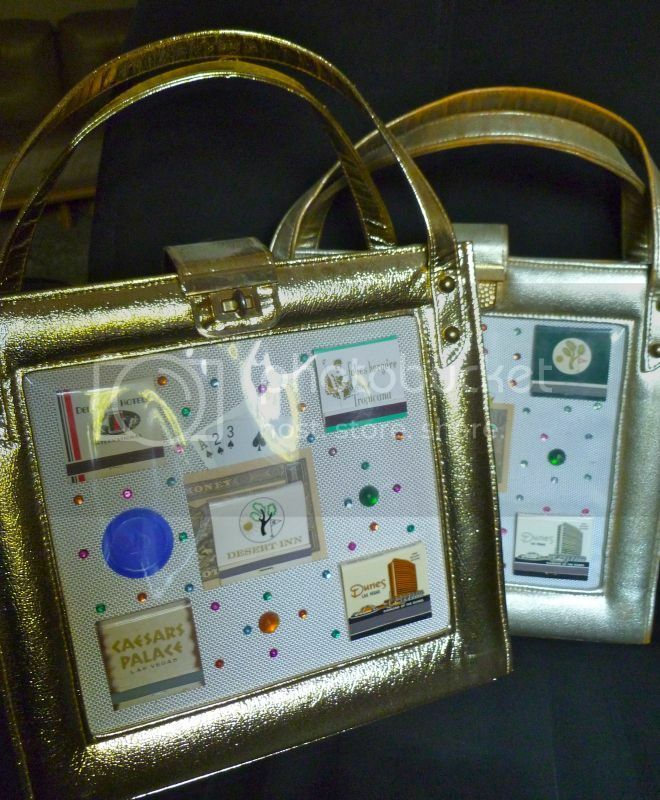 If I see one of these bags listed for sale anywhere, I'll send you the link. 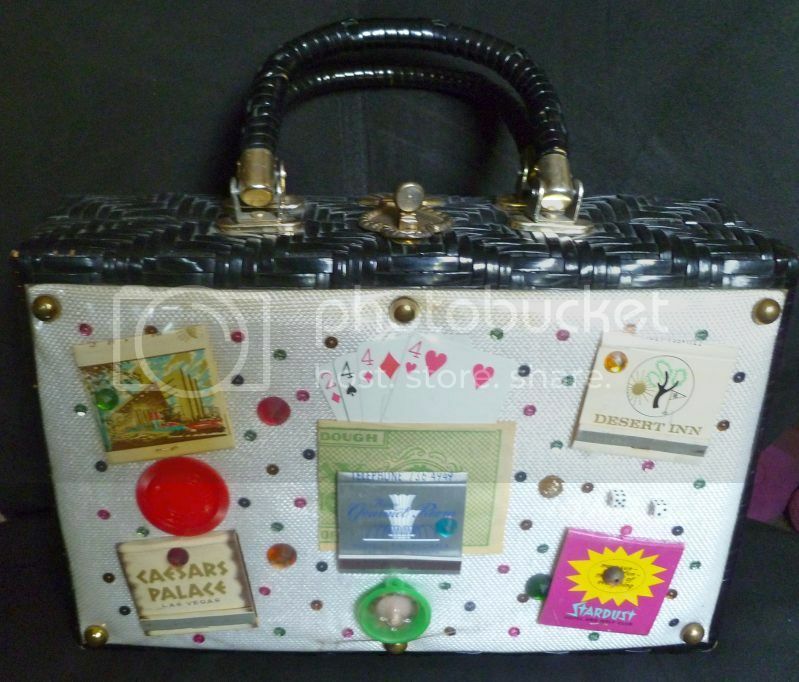 I'm pretty sure I'm at my limit of Faye Mell casino purses. P.P.S. Don't tell my husband.